Shimano TLD-2 speed reels have been very popular with New Zealand anglers for a long time now. They are strong, dependable and light-weight. The big Shimano XT-7 composites have found ready acceptance in New Zealand and around the world. For those in search of “beakie” they are renown for their rugged dependability and fish-fighting qualities. Beakie is of course marlin and billfish. The big TLD-50 has quiet a reputation among anglers when used in the stand-up roll for which it is ideally suited. Made from XT-7, a material said to be more resistant to stress and torque than graphite. The TLD -50 weighs 1.590kg. Gear ratios are: 3.5:1 and 1.4:1. High gear is used to regain line quickly, while low gear is used to gain a mechanical advantage when pumping a stubborn fish from down deep. 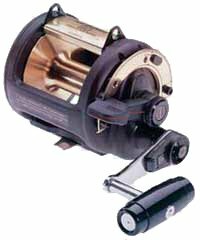 These reels are made for serious fishing of big fish where a hard prolonged fight with a huge tuna or broadbill sword fish can last all night. You need a reel that isn’t going to let you down. Shimano’s TLD reels have proven their worth with deep sea anglers and game fishermen the world over. Line capacity is 700 metres of 24kg monofilament. Aluminum spool. Four ball bearings. For those who have “everything” the TLD 50 can also be spooled with braid to fish very deep water. The robust nature of the reel, powerful gears, and huge line capacity make it perfect for this specialist form of fishing.